BJP chief Amit Shah is declaring his party's victory on Twitter and is thanking the people for the big mandate that his party seems to be winning. UTTAR PRADESH: Trends available for all 403 constituencies. The BJP is ahead in 298 seats, with closest rival Samajwadi Party leading in 58 seats. The Congress is leading in eight seats. 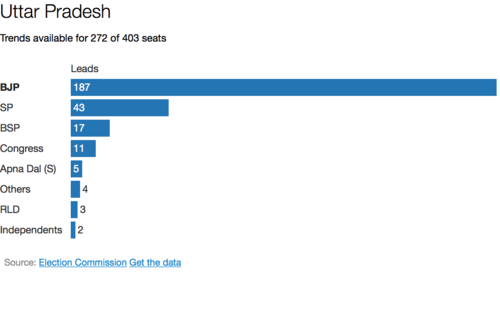 Despite an overall vote share of 22 percent, Mayawati’s BSP is leading only in 18 seats. 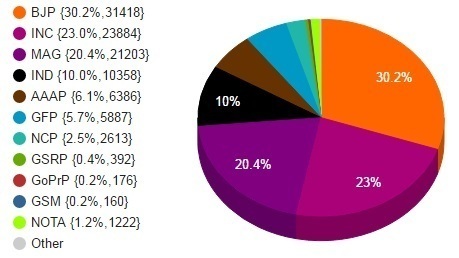 GOA: Trends (wins plus leads) available for 22 of 40 constituencies. The Congress and the BJP are tied at eight seats apiece. Incumbent Congress is on a downhill in the northern state at the foothills of the Himalayas. The state faced a massive flood in 2013. UTTAR PRADESH: Garima Singh (BJP) leading in Amethi assembly constituency. Gayatri Prasad Prajapati (Samajwadi Party), who won in 2012 election, is in second place. UTTAR PRADESH: Independent candidate Raghuraj Pratap Singh (Raja Bhaiya) leading in Kunda assembly constituency in Pratapgarh district. As per trends and results from Uttar Pradesh, BJP and allies are now ahead on 300 seats from a total of 403. A party can form government in the state with 202 seats. Who will be the BJP Chief Minister is the big question now. Party leaders insist their newly elected lawmakers will choose their own leader in the state. PUNJAB: Sukhpal Singh of the Aam Aadmi Party has won from Bholath, beating the Shiromani Akali Dal candidate Yuvraj Bhupinder Singh by 8,202 votes. PUNJAB: Kanwar Pal Singh of the Congress has won from Anandpur Sahib, beating his BJP rival Parminder Sharma by 23,881 votes. Singh had lost to the BJP in 2012. Irom Sharmila Chanu, who formed the PRJA party last year after ending a 16-year hunger strike to protest the Armed Forces Special Powers Act in the state, gets just 90 votes in Thoubal constituency. Chief Minister Okram Ibobi Singh of the Congress wins the seat with a margin of 10,470 votes. Sharmila came in fourth among six candidates. GOA: BJP’s Chief Minister Laxmikant Parsekar is trailing Congress candidate Dayanand Sopte at Mandrem by a wide margin. Overall incumbent BJP is leading in 7 seats while Congress is ahead in 8 seats. Status is known for 20 seats out of the 40 in the state (trend+result). PUNJAB: Trends available for 112 of 117 constituencies. The Congress is leading in 61, followed by the Shiromani Akali Dal in 23 and the Aam Aadmi Party in 22. BJP candidates are ahead in five seats. Analysts on various news channels are now of the opinion that the trends are so clear in all states that the actual results will not be any different now. 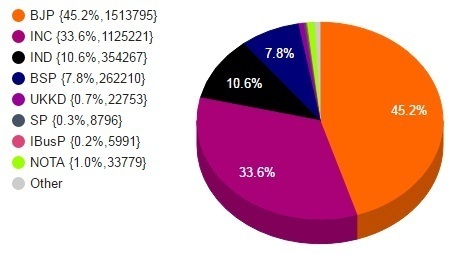 As per the trends from election commission in Uttar Pradesh, BJP leads with 40.6 percent vote share. Interestingly Mayawati’s BSP is second with 22.3 percent share. 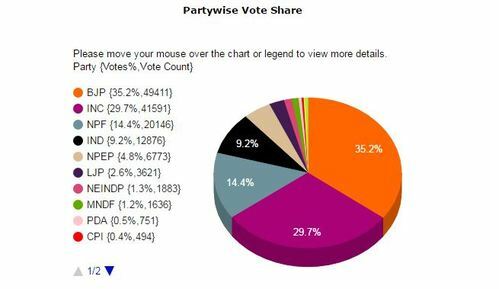 SP-Congress alliance has a combined share of 27.6 percent vote share. The ballot in Uttar Pradesh represents the most important electoral test that the BJP has faced since winning the 2014 general election. Having campaigned in the state for two months, Prime Minister Narendra Modi and his election strategist Amit Shah can take credit if the BJP wins - but may face a backlash from sidelined party elders if they come up short. 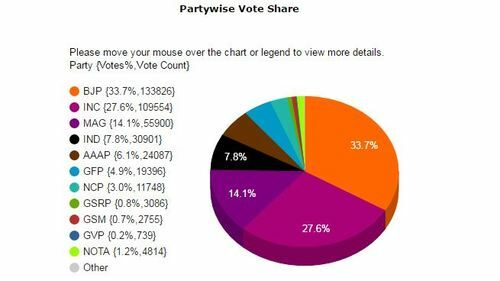 Trend: Vote share of various parties in Goa, as per the election commission. PUNJAB: Amarinder Singh of the Congress leading in Patiala, with Balbir Singh of the Aam Aadmi Party in second place. 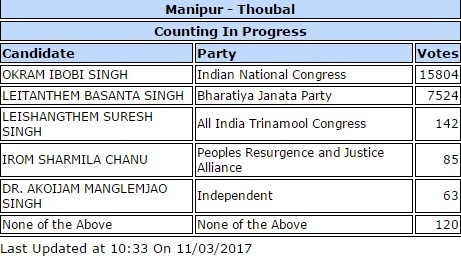 MANIPUR: Trends available for 8 of 60 constituencies. The BJP is leading in 3, followed by the Congress in 2. GOA: Trends available for 12 of 40 constituencies. The Congress is leading in five, followed by the BJP in three. PUNJAB: Trends available for 72 of 117 constituencies. The Congress is leading in 33, followed by the Aam Aadmi Party in 20 and the Shiromani Akali Dal in 16. BJP candidates are ahead in three seats. UTTAR PRADESH: Trends available for 155 of 403 constituencies. The BJP is leading in 98, followed by the Samajwadi Party in 28. The Bahujan Samaj Party is leading in 14 seats while the Congress is ahead in six. 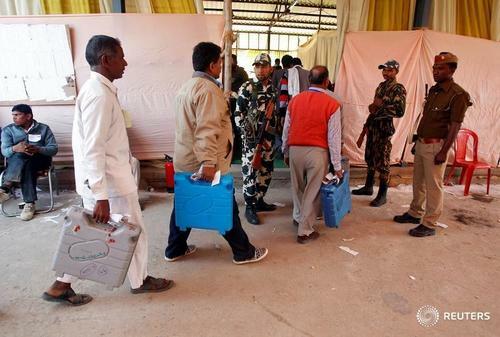 UTTARAKHAND: Trends available for 34 of 70 constituencies. The BJP is leading in 27, followed by the Congress in five.